During the first year of MIPS, it is deceptively easy to avoid the penalty. In a CMS blog post released a few weeks before the final rule was published, the Acting Administrator for CMS, Andy Slavitt, announced that there would be MIPS pacing options to allow eligible clinicians to ease into the program. The most basic level of reporting, referred to sometimes as the MIPS Test Option, is so simple to complete that it absolutely seems to good to be true. To exclusively avoid the MIPS penalty, an eligible clinician or group only has to submit the minimum amount of data for one out of the three performance categories. The performance threshold for the MIPS score (the minimum number of points required to avoid the penalty) is three points. These three points are very easy to achieve in each performance category. A qualified MIPS registry, like MIPSPRO, will be able to confirm that you've reached the performance threshold to avoid the penalty. All that must be reported for the Quality Performance Category is performance data for one quality measure, covering at least one patient that met the quality action detailed in the measure description. For example, you could attest that you documented a patients current medications (measure #130) one time, and avoid the MIPS penalty. To achieve any points at all in this performance category, you must report to all ACI base measures. This will be either 4 or 5 measures depending on your EHR certification, covering familiar objectives like ePrescribing, Health Information Exchange, Providing Patient Access, and Security Risk Analysis. The base measures for ACI account for 50% of the ACI category score, so successfully attesting to these will not only allow you avoid the penalty, but may make you eligible for a slight incentive. As the newest addition to the CMS array of quality initiatives, the Improvement Activities Performance Category is one of the simpliest to report. To report minimally in this category, an eligible provider or group only has to attest that they performed one of the 92 available Improvement Activities during the 2017 performance year. With reporting being this easy this year, it is definitely tempting to do the bare minimum and then enjoy the break from quality reporting. However, the ease of reporting this year should be taken as an opportunity to test your internal workflows for reporting efficiency. Although the performance year of 2018 definitely going to be a transition year as well, it will certainly not be as lenient as the current performance year. The percentage of patients you will be required to report on for success will be slowly ramping up to reach 90% of all payers. Additionally, the MIPS payment adjustment will increase. 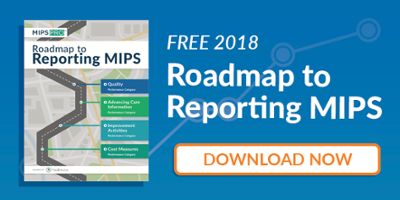 With the intent of empowering Medicare Part-B beneficiaries, an assortment of MIPS data points will be published on Physician Compare. This includes, but is not limited to, your MIPS final score. To ensure your reputation accurately reflects the care you are providing, it is best to shoot for above a minimum score. MIPS is definitely a nuanced and at times tricky program. Finding a good technology partner to support efficient reporting and MIPS score prediction will be important to making the adjustment. To ensure success, start reporting early and submit as much data as possible!